The Tree Top Residence celebrates the site’s complex landscape, merging seamlessly and emerging from atop the canopy of trees that surround it. 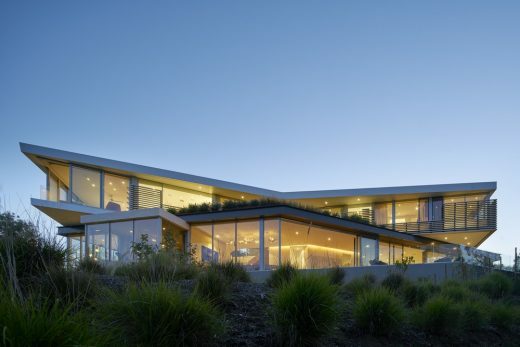 Built along a natural ridgeline, the long and narrow plan of the three-story house mimics and inverts the angles of the site’s topography, creating dynamic vertical and horizontal relationships. 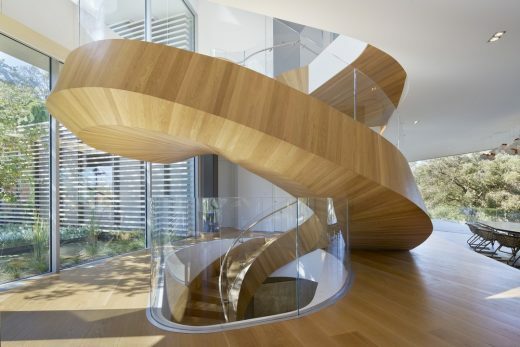 Vertically, an eccentrically-helical stair functions as a primary organizing element and a sculptural gesture upon entry into the house. 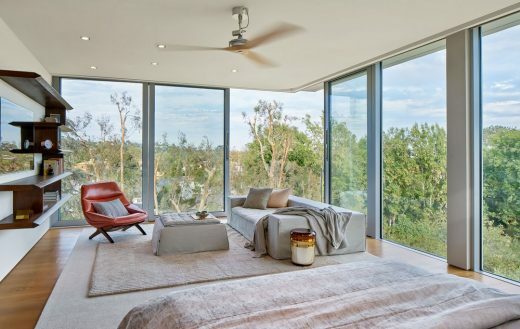 On the ground floor, it acts as a threshold into the open plan; on the floor above, it separates the master suite and children’s quarter, while providing a light well to the basement. 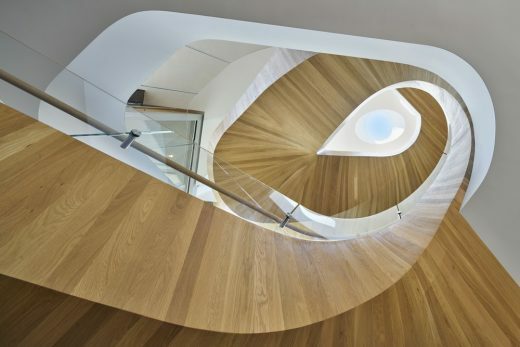 Horizontally, walls are used sparingly in favor of fluidly connected spaces. Movement and views between dining areas, kitchen, play and gathering spaces are uninterrupted, and floor-to-ceiling sliding glass doors blend the interior with the outside. 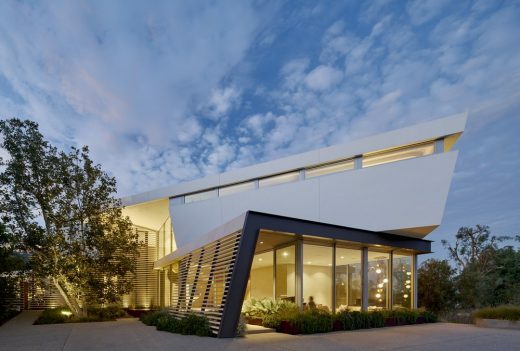 Hidden from the street, the residence is insulated from its neighbors, but open to its site. Canted limestone louvers, and dense planting on the north facade shield the interior from the closest adjacent neighbor. 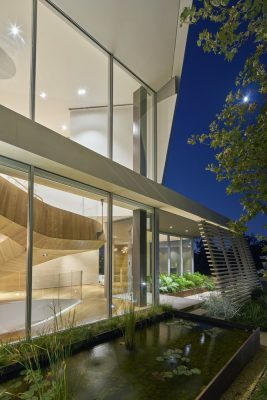 Conversely, the rest of the building opens to the site with floor-to-ceiling glazing, relying on both the house’s generous distance from the property line, and the densely wooded valley below to create a natural screen. The orchestration of this view, overlooking a dense canopy of trees, embodies the intent to offer respite from the city below. 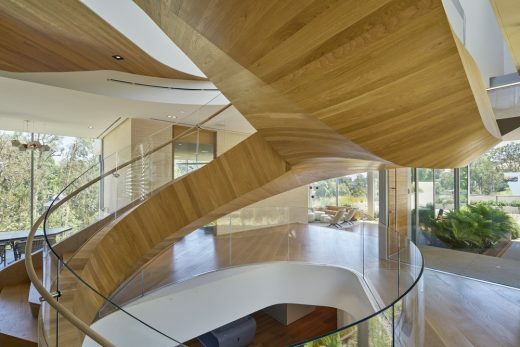 Soils Engineer: Grover Hollingsworth & Associates, Inc.
Civil Engineer: Fuscoe Engineering, Inc.
Special FabricationL Spectrum Oak (Stairs), Funtime Cabinet Factory (Millwork), Fusion Flooring (Kitchen Stair and wood flooring).